A great way to gather the girls for a memorable bridal shower party is by making it an occasion they'll never forget. What better way to do so, than with a captivatingly lovely bridal luncheon? Our collection of bridal luncheon invitations are so delicate in design, but add such a touch of grace and sophistication, you're certain to find one that fits every need. From bridal shower games to cakes and gift ideas, our Pinterest board is just gushing with themes and ideas. You'll also get your fill of our wording ideas and the custom printing templates we suggest using for any luncheon. Perhaps you need recipes for your luncheon or dinner, we've got those too. One of the most popular bridal shower party themes comes in the form of lingerie. If you're looking to spice up the soiree, try perusing through our lingerie shower invitations. This fun and flirtatious theme features invites with die-cut card designs and pink or red text with feisty lingerie-inspired graphics. But with all this bridal shower planning, you can't forget about the rehearsal dinner! A great time to segue into the wedding festivities is through a rehearsal dinner, which is why our rehearsal dinner invitations are one-of-a-kind. From more formal table invitations, to fun, fiesta couple invitations, make this dinner party one for the books. Make Polka Dot Design a one-stop-shop and find all your wedding, and wedding party invite needs. Our save the date photo cards are worth a look, as they feature some of the most unique designs and invitation decorum around. Each save the date card can be customized to your liking, and include a bit of your personality with just the click of a button. 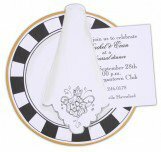 Save up to 20% or free shipping on bridal luncheon invitations. For more information, contact us at service@polkadotdesign.com or call the Polka Dot hotline 1-877-816-0884. Give us a call and we can help you learn how to throw a bridal shower or even who plans the bridal shower. Sometimes you may just need to know when to have the shower or luncheon and who should pay. Either way, we're here to help with all your custom printed invitations.